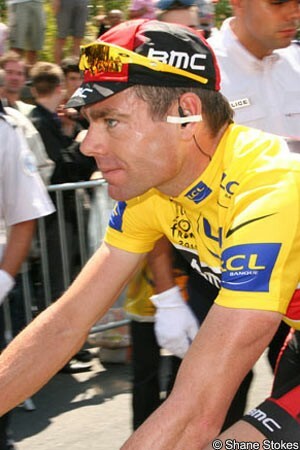 Cadel Evans may have become one of the oldest-ever winners of The Tour de France last July, but the fact that he’ll be a year older again in 2012 doesn’t cause him to reduce his ambitions. He’s clear about what he wants heading into the new season; namely, to wear yellow again in Paris. Evans has already indicated that he won’t compete in the Santos Tour Down Under, preferring to delay his season start and build up to a prolonged peak for the Tour and Olympic Games. He won Tirreno-Adriatico earlier this year and is expected to head back there again; if he opts to repeat the key events of his season, he’ll also be back to defend his title in the Tour de Romandie plus the runner-up slot in the Critérium du Dauphine. Some had anticipated a rivalry with Philippe Gilbert in that event, particularly as both have said they want to win it during their careers, but it’s not certain if the Belgian will even ride it in 2012. He said several months ago that he was nervous about the possibility of crashing on the cobbles and being injured, and so he may opt to give it a miss next season and wait another year. He dominated this season, winning 18 races, and said recently that he expects to be stronger again in 2012. However he also makes it clear that he doesn’t presume that stronger legs will translate into better results. The Classics will be his first goals of the season. Last season he was third in Milan-Sanremo, then went on to take an extremely rare Ardennes Classics treble of Amstel Gold, Flèche Wallonne and Liège–Bastogne–Liège, as well as Brabantse Pijl. Those races will be on his hit list again; before then, he’ll concentrate on building form as well as possible. According to directeur sportif Jean Lelangue, the team has two major goals. The first will be the Classics, while the second is to try to help Evans take his second Tour win. “We want to make sure that in July we have the strongest team there to defend the title,” the Belgian explained. “We have acquired riders who will be very strong teammates for Cadel [and] who are Classic-type riders. Our objective in the Classics is to again take a proactive role. President/General Manager Jim Ochowicz recognises that the team has made some big acquisitions and could be on the cusp of an even better season than it had in 2011. Both Hushovd and Gilbert have come on board, and so too other strong signings such as Tejay Van Garderen, a highly promising US rider who finished third in the 2010 Critérium du Dauphiné. Alessandro Ballan (ITA), Adam Blythe (GBR), Brent Bookwalter (USA), Marcus Burghardt (GER), Stephen Cummings (GBR), Yannick Eijssen (BEL), Cadel Evans (AUS), Mathias Frank (SUI), Philippe Gilbert (BEL), George Hincapie (USA), Thor Hushovd (NOR), Martin Kohler (SUI), Klaas Lodewyck (BEL), Amaël Moinard (FRA), Steve Morabito (SUI), Taylor Phinney (USA), Marco Pinotti (ITA), Manuel Quinziato (ITA), Tim Roe (AUS), Mauro Santambrogio (ITA), Ivan Santaromita (ITA), Michael Schär (SUI), Johann Tschopp (SUI), Greg Van Avermaet (BEL), Tejay Van Garderen (USA), Danilo Wyss (SUI).